ENGLAND/SCOTLAND. Carlisle Recaptured, Jacobite Rebels Retreat to Scotland. 1745. AR medal. 14.93 gm. 35 mm. By A. Kirk/J. Kirk. 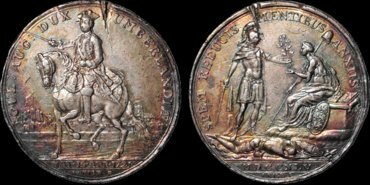 The Duke of Cumberland on horseback, left, sword raised, city (Carlisle) behind; GUL AUG DUX CUMBERLANDIÆ around; NAT 15 APR 1721 in exergue; A KIRK F in small letters below / The Duke, standing, handing an olive leaf to Anglia, seated; below, a prostrate rebel with a papal shield; SPEM REDUCIS MENTIBUS ANXIIS; MDCCXLV in exergue; I KIRK F in small letters below. Eimer 598. Woolf (Jacobite) 58.1. Lustrous Extremely Fine with beautiful toning; a dig at 11 obverse and corresponding on the reverse that looks as if the piece was caught or crimped at manufacture or soon after. 2 COINS. AUSTRIA. Salzburg Archdiocese. AR batzen. 2.89 gm. 25.5 mm. 1511. Mitred bishop with rood, facing / Arms, date above, L below. Good Very Fine. Also: Salzburg 3 groschen. 1681. 1.62 gm. 20 mm. Bishop / Arms, date over. Extremely Fine. FRANCE. CAROLINGIAN. Arras. Charles the Bald. 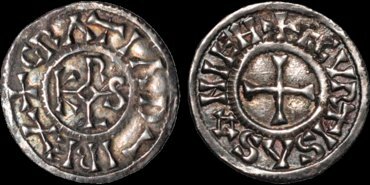 843-877 (King of France, the West Frankish Kingdom). AR denier. 1.37 gm. 20 mm. 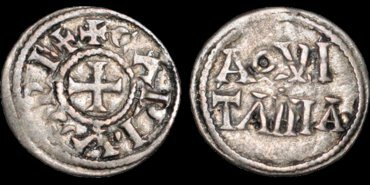 Karolus monogram; +GDATIAD–II'EX / Central cross; +ATREB'ATISCIVITAS. Morrison & Grunthal 750. Very Fine; somewhat blundered strike. Morrison and Grunthal note examples of this type only as "ANS Find." Also known as Charles II of the Holy Roman Empire, 875-877. FRANCE. CAROLINGIAN. Charles the Bald. 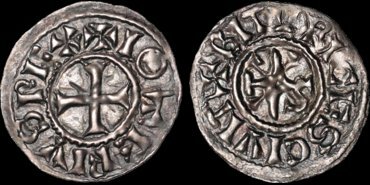 843-877 (King of France, the West Frankish Kingdom). AR denier. 1.68 gm. 20 mm. 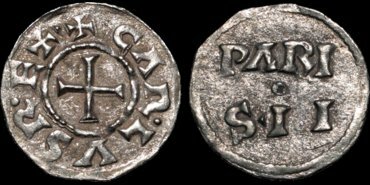 Central cross; CARLVS REX / PARI S•II in two lines, an annulet in the center. Morrison & Grunthal 826. Good Very Fine. Also known as Charles II of the Holy Roman Empire, 875-877. FRANCE. CAROLINGIAN. Paris. Charles the Bald. 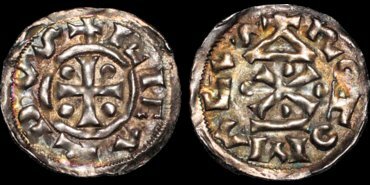 843-877 (King of France, the West Frankish Kingdom). AR denier. 1.66 gm. 20 mm. 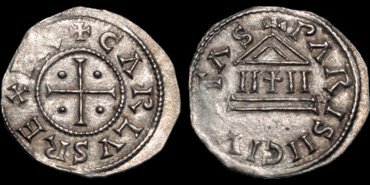 Karolus monogram; +CRATIAD– I REX around / Central cross; +PARISII CIVITAS around. Morrison & Grunthal 833. Extremely Fine; blue-gray tone on good metal. Also known as Charles II of the Holy Roman Empire, 875-877. FRANCE. CAROLINGIAN. "Curtisassonien". Charles the Bald. 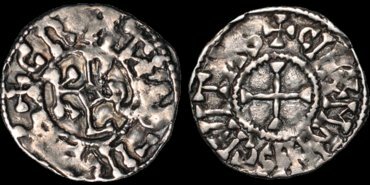 843-877 (King of France, the West Frankish Kingdom). AR denier. 1.52 gm. 19 mm. Karolus monogram; +GRATIAD–IREX / Central cross; +ICVRTISASONIEN. Morrison & Grunthal 895. Extremely Fine; old toning over fresh surfaces. Also known as Charles II of the Holy Roman Empire, 875-877. FRANCE. CAROLINGIAN. Le Mans. Charles the Bald. 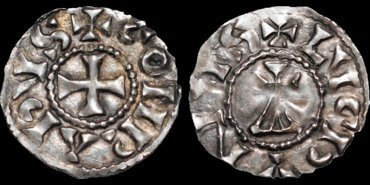 843-877 (King of France, the West Frankish Kingdom). AR denier. 1.45 gm. 20 mm. Karolus monogram; +CRATIAD–IREX / Central cross; +CINOMANISCIVITAS. Morrison & Grunthal 908. Good Very Fine; somewhat blundered strike. Also known as Charles II of the Holy Roman Empire, 875-877. FRANCE. CAROLINGIAN. Aquitaine. Charles the Bald. 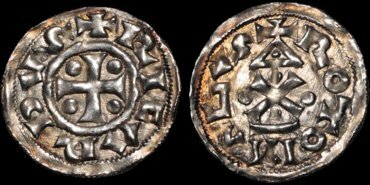 843-877 (King of France, the West Frankish Kingdom). AR obolus. .79 gm. 17 mm. Central cross; +CARLVS REX / AQVI TANIA in two lines. Morrison & Grunthal 1053. Very Fine. Also known as Charles II of the Holy Roman Empire, 875-877. FRANCE. CAROLINGIAN. Melle. Charles the Bald. 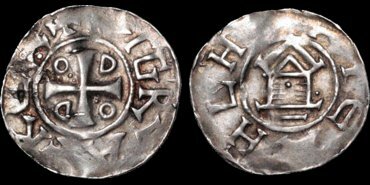 843-877 (King of France, the West Frankish Kingdom). AR obolus. .78 gm. 17 mm. Karolus monogram / Central cross; +METVLLO. Morrison & Grunthal 1060. Very Fine; bold. Also known as Charles II of the Holy Roman Empire, 875-877. FRANCE. CAROLINGIAN. Melle. Charles the Bald. 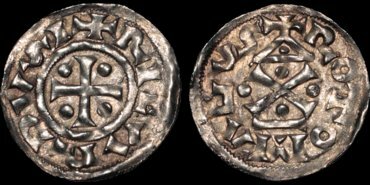 843-877 (King of France, the West Frankish Kingdom). AR denier. 1.74 gm. 21 mm. Central cross; +CARLVS REX FR / Karolus monogram; +METVLLO. Morrison & Grunthal 1063. Extremely Fine; attractive toning, good metal. Also known as Charles II of the Holy Roman Empire, 875-877. FRANCE. CAROLINGIAN. Melle. Charles the Bald/Charlemagne. 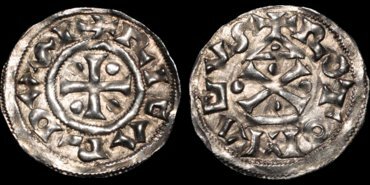 843-877 (King of France, the West Frankish Kingdom). AR denier. 1.62 gm. 22 mm. Central cross; +CARLVS REX FR / Karolus monogram; +METxVLLO. 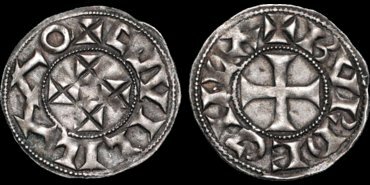 Morrison & Grunthal 1063 (Charlemagne, same basic design, M&G 172). Extremely Fine; lightly toned over fresh surfaces. 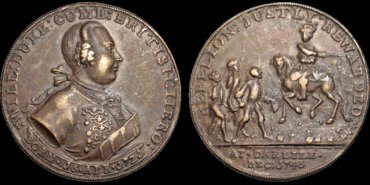 M&G note at 172: "This type was struck extensively under Charles the Bald…." 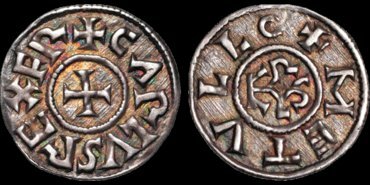 Grierson (MEC I) 937 "All deniers of 'Melle'…cannot be distinguished with certainty from those struck early in Charles the Bald's reign." (p 544). FRANCE. CAROLINGIAN. Bourges. Charles the Bald. 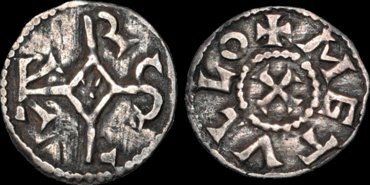 843-877 (King of France, the West Frankish Kingdom). AR obolus. .83 gm. 16 mm. Central cross; CARLVSREX / Karolus monogram; +BITVRICESCIVI. Morrison & Grunthal 1072. Good Very Fine. Also known as Charles II of the Holy Roman Empire, 875-877. FRANCE. CAROLINGIAN. (Indeterminate mint). Charles the Bald. 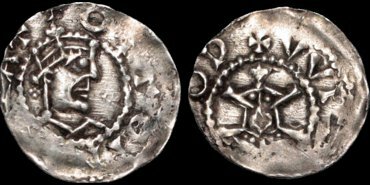 843-877 (King of France, the West Frankish Kingdom). AR denier. 1.62 gm. 20 mm. 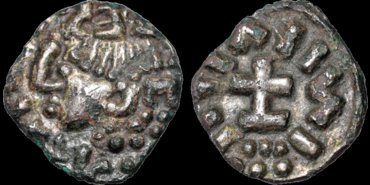 Central cross with pellet in each angle; +CARLVS REX FR / Front of a temple; XPISTIANARELICIO (Christiana Religio reverse type). Morrison & Grunthal 1157. MEC I: 848. Near Extremely Fine. Also known as Charles II of the Holy Roman Empire, 875-877. FRANCE. MEDIEVAL. Paris. Charles the Bald. 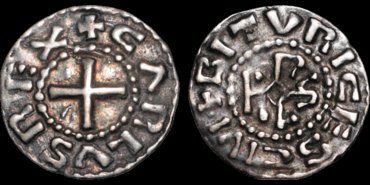 843-877 (King of France, the West Frankish Kingdom). AR denier. 1.61 gm. 21 mm. Central cross with pellet in each angle; +CARLVS REX FR / Front of a temple; +PARISII CIVITAS. Roberts 1313. Extremely Fine. Also known as Charles II of the Holy Roman Empire, 875-877. FRANCE. FEUDAL. Melle. Charles the Simple. 898-923. AR denier. 1.08 gm. 22 mm. (Mid 900s). 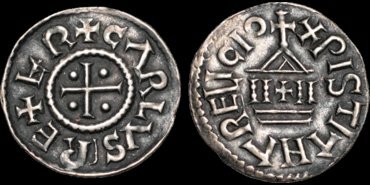 Central cross; +CARLVS REX R / MET ALO in two lines. Poey D'Avant 2457 (Pl LIV. 1). Good Very Fine. FRANCE. MEDIEVAL. Normandy (Duchy). Richard I ("the Fearless"). 943-996. AR denier. 1.24 gm. 20 mm. Cross, pellets in angles; +RICARDVS / A temple with pediment, cross of St. Andrew base; +ROTIOXIAGVS. Cf. De Wit 335. As made. Künker, De Wit note: "in the hoard of Fecamp" (found 1963, buried circa 985; an unknown type prior to the hoard?). 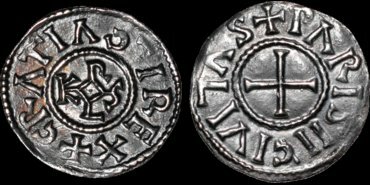 Richard I was the grandson of Rollo, the Norwegian Viking who seized Rouen in 876 who established Viking ("Norman") presence in Normandy. There is a monument to Rollo in Rouen. William I was a descendant. It was from a beach and river in Normandy that was one of the D-Day landing points that William sailed to Pevensey and then marched northeast to Hastings where he defeated Harold II in 1066. FRANCE. MEDIEVAL. Normandy (Duchy). Richard I ("the Fearless"). 943-996. AR denier. 1.12 gm. 20 mm. Cross, pellets in angles; +RICARDVS / A temple with pediment, cross of St. Andrew base; +ROTIOXIAGVS. Cf. De Wit 335 (Not listed in Poey D'Avant, et al). Good Extremely Fine; attractive light toning over original surfaces. 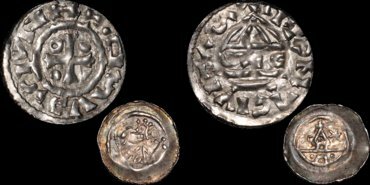 Künker, De Wit note: "in the hoard of Fecamp" (found 1963, buried circa 985; an unknown type prior to the hoard?). FRANCE. MEDIEVAL. Normandy (Duchy). Richard I ("the Fearless"). 943-996. AR denier. 1.27 gm. 20 mm. Cross, pellets in angles; +RICARDVSI / A temple with pediment, cross of St. Andrew base; +ROTIOXIAGVS. Cf. De Wit 335. As made. Künker, De Wit note: "in the hoard of Fecamp" (found 1963, buried circa 985; an unknown type prior to the hoard?). FRANCE. MEDIEVAL. Normandy (Duchy). Richard I ("the Fearless"). 943-996. AR denier. 1.1 gm. 20 mm. Cross, pellets in angles; +RICARDVSI / A temple with pediment, cross of St. Andrew base; +ROTIOXIAGVS. Cf. De Wit 335 (Not listed in Poey D'Avant, et al). As made. 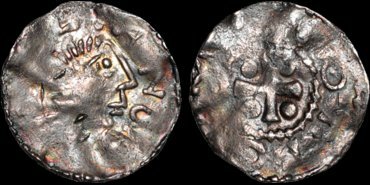 Künker, De Wit note: "in the hoard of Fecamp" (found 1963, buried circa 985; an unknown type prior to the hoard?). FRANCE. MEDIEVAL. Normandy. Rouen. Richard I ("the Fearless"). 943-996. AR denier. 1.03 gm. 21 mm. Central cross; +RIHARDVS around / Four temple pediments in a cross, a small cross in the center; M CO + M(C) D(C), both Cs reversed. Poey D'Avant 122. Very Fine; stable green deposit, both sides. FRANCE. CAROLINGIAN. Aquitaine. Lothaire. 954-986. AR denier. 1.29 gm. 22 mm. Central cross; +IOTERIVSREX / Deformed Karolus monogram; +BITVRICESCIVIT. Morrison & Grunthal 1666. Extremely Fine; even blue-gray toning over fresh surfaces. FRANCE. MEDIEVAL. Strasbourg. Bishop Widerold, with Otto III. 991-999 and 983-1002. AR denier. 1.09 gm. 18 mm. Crowned bust right; OTTO IMPERAT / Church; +VVI...OD. Dannenberg 939. Good Very Fine; crisply struck in center, a little weak in margins; attractive example with pleasing light tone. FRANCE. CAROLINGIAN. Burgundy. Lyon. Conrad the Pacific. 997-993. AR denier. 1.35 gm. 21 mm. Central cross; +CONRADVS / A cross on a triangle; +LVGDVNVS. Morrison & Grunthal 1683. Good Very Fine; attractive toning over fresh surfaces. FRANCE. MEDIEVAL. Strasbourg. 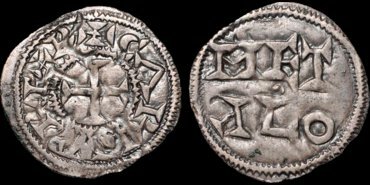 Henry II. 1002-1024. AR denier. 1.34 gm. 20 mm. Crowned head right; HEINRICVS R… / A R IGNA in three lines (ARGENTINA). Cf. DeWit 585. Very Fine; but weakly struck in part. FRANCE. PROVINCIAL. Aquitaine. Guillaume X. 1127-1137. AR denier. 1.05 gm. 20 mm. Bordeaux mint. 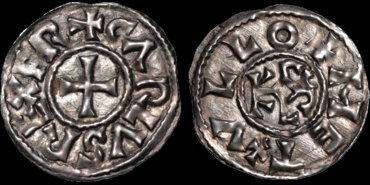 Four central crosslets; +GVILILMO around ("G" is made up of two distinct punches) / Short cross with flared ends; +BVRDEGVLA around. Poey D'Avant 2733. Roberts 4301. Good Very Fine. William X, the father of Eleanor of Aquitaine, wife of Henry II of England. GERMANY. Magdeburg. Otto III. 983-1002. AR pfennig. 1.29 gm. 19 mm. 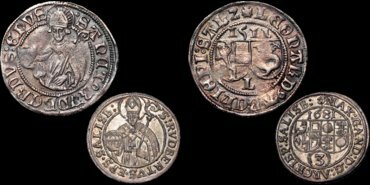 Otto-Adelheid-pfennige, 984-995. Cross, O D D O in angles; +DI GRA REX around / Church front; ATEAHLH… around. Cf. DeWit 1541-2. Very Fine. GERMANY. Wurzburg. Otto III as King. 983-1002. AR pfennig. 1.04 gm. 177 mm. Bust of St. Kilian right / Small cross, pellets in angles. Good Very Fine; on good metal but weakly struck. 2 COINS. GERMANY. Regensburg. 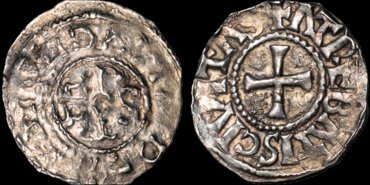 Henry II. 985-995. AR pfennig. 1.48 gm. 20 mm. 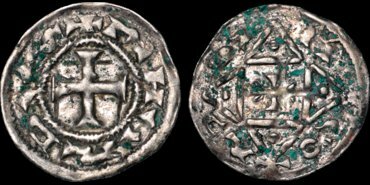 Cross with pellet and annulet in two quarters; HENRICV DVX retrograde around / A temple, legend around. Hahn 1976. 22. Near Extremely Fine; as made but cracked (is in a protective capsule). 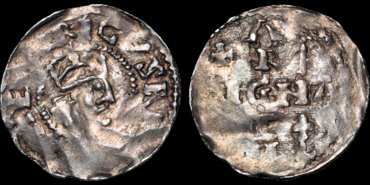 Also: a small silver Offenburg issue of Frederick II. Holy Roman Emperor, 1194-1250. .43 gm. 15 mm. King facing left, holding cross / A church topped by a cross, a star to right. Good Very Fine.